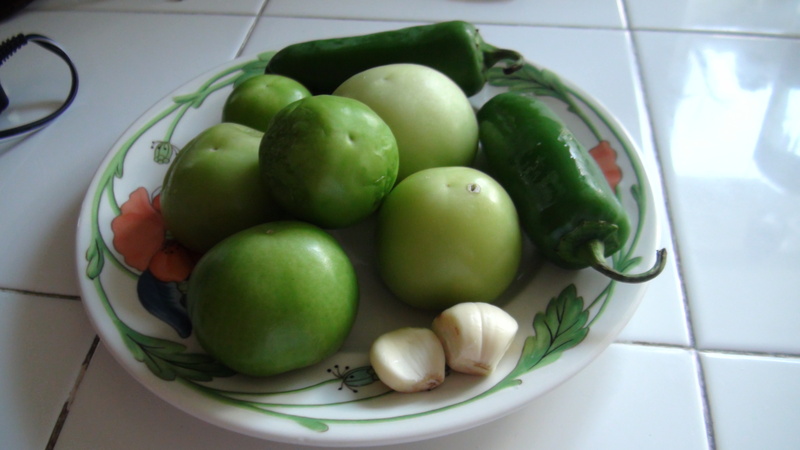 In our family salsa verde is a staple we use on a variety of dishes . 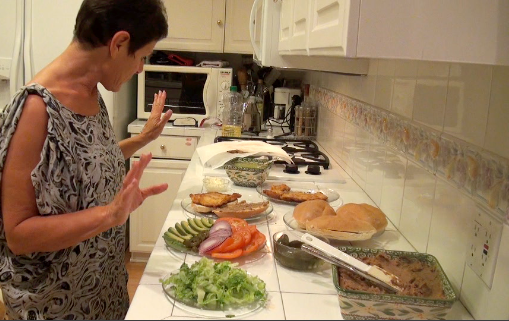 We put it on our Schnitzel and our tacos, our roasted chicken and our eggs; we even put it on our gefilte fish. If you’re tired or in a rut or limited in the dishes you prepare for yourself or for your family, SPICE THEM UP with salsa verde. One of my favorite ways to enjoy Salsa Verde is simply as an appetizer with freshly homemade lightly salted tortilla chips. I also make homemade tamales with a chicken in salsa verde filling. stay tuned for the recipe! 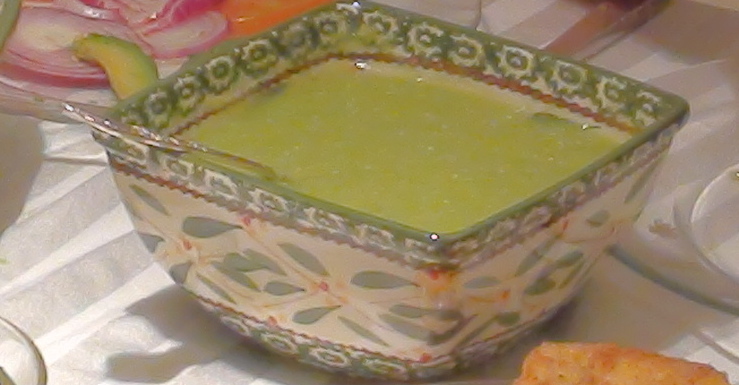 This rich and spicy, typical Mexican green sauce takes almost any dish to a whole new level. So put some variety in your life and try it for yourself. You choose the degree of spiciness you like, by adding or subtracting the number of hot peppers you use. 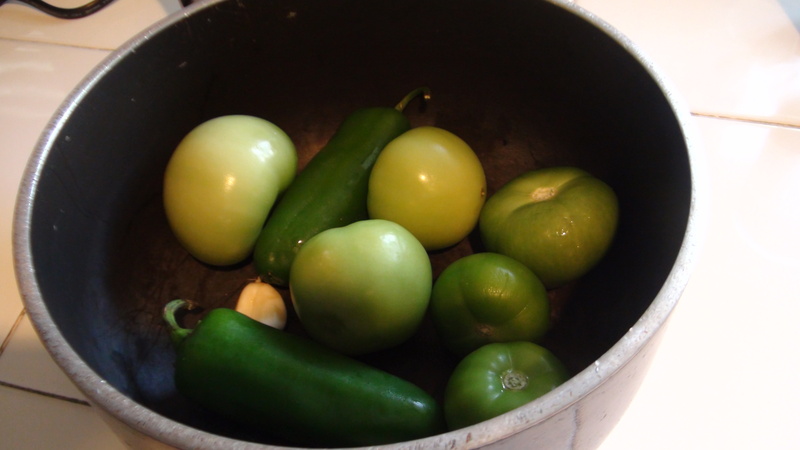 Place the tomatillos, jalapeño peppers and 2 garlic cloves in a small saucepan, cover with water and bring to a boil. Lower flame and simmer for five minutes. Add the 1/4 cup of water to a blender and then add the cooked ingredients from the saucepan, minus the water. Add the 1/4 small onion. If you choose, add the extra garlic clove and if you like it very spicy, add the extra optional jalapeño pepper. Add the salt and Blend until you have a smooth rich sauce. .
As a child in Mexico City, Chapultepec Park, with its zoo and bike paths, was a magical place. Going to Chapultepec meant fun, and it meant the yummy food, that the street vendors sold from their little carts. I loved the tortas de milanesa. They were Schnitzel sandwiches on special wide puffy rolls called teleras. They were made with a breaded chicken cutlet, a little mayo, re-fried beans, sliced onion, avocado, tomato, and spicy salsa or jalapeño peppers. A couple of days ago I got a craving for that Schnitzel Torta from my childhood so I went to a panadería, a Mexican style bakery here in L.A. to buy a few of those wide puffy rolls called a teleras. Every time I walk into a panadería, the scent of the freshly baking bread and pastries is exactly the same as that of the bakeries in Mexico. The scent transports me to the times in Mexico, when as a little girl, every evening, my nanny and I would walk up two hilly streets from our house, to get to Avenida De Las Palmas. We would cross the wide grassy divider to go buy a dozen of the freshly baked teleras or bolillos, at the panadería in our neighborhood of Barrilaco. We would take the warm rolls home and have them with our supper. If I was really hungry I would ask for a torta. My favorite was torta de milanesa. So at the panadería I went to the other day, I made sure that the rolls contained no dairy nor animal products, and I bought four telera rolls. 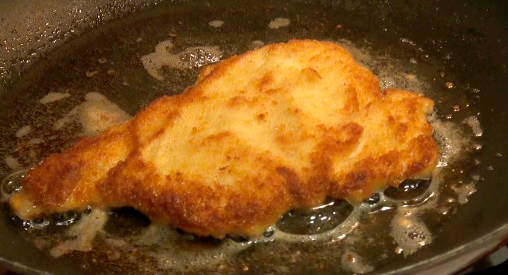 Then, I went to the kosher butcher where I asked for four pounded chicken steaks so I could make my special schnitzel sandwiches. 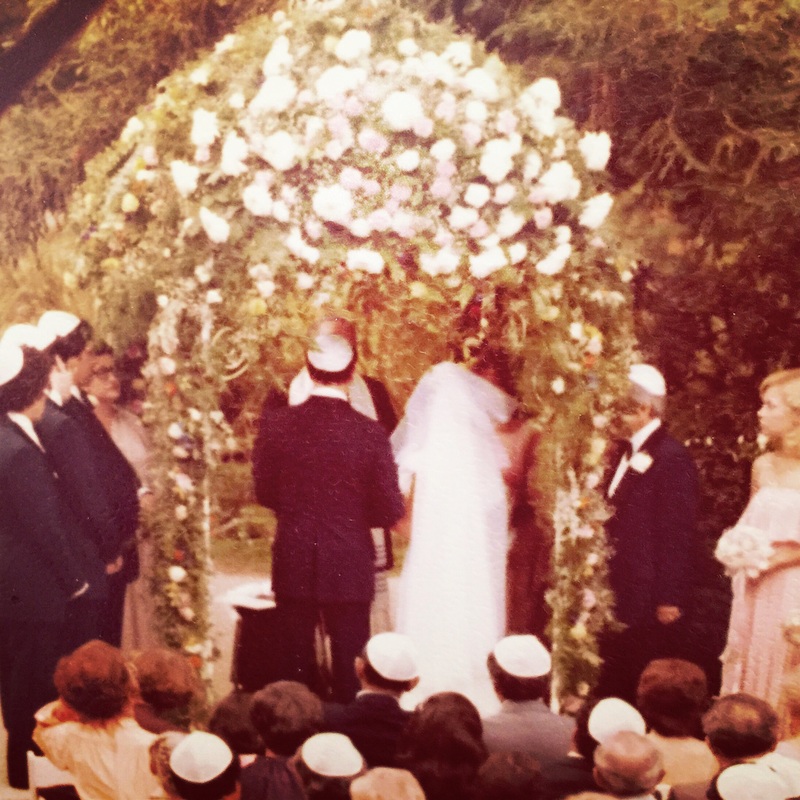 Reposting The Chuppah And A Mariachi Band, A Perfect Marriage – In Honor Of Our #37th Wedding Anniversary! I wore a simple white dress made in Mexico that I bought while living in Jerusalem. My father walked me down the aisle on the stony path of a lovely hotel garden. Awaiting me at the flower covered chuppah, was my beloved Isaac. We tightly held hands and listened intently as The Rabbi explained the meaning of the journey we were embarking on. Inside the reception ballroom a different band played and we danced the hora for what seemed like hours, then as we got lifted up on chairs, amid smiles, tears, dancing and laughter as if in slow motion, acknowledging the wonder of it all, I gave thanks for my wonderful rich heritage. This was my Mexican/Jewish wedding. I was born in Mexico and it was an exciting place to grow up! On Sunday mornings my American born daddy and I would go to the supermarket and do the shopping for the week. The newly opened supermarket ‘Aurrera,’ was fun and colorful! There was the “Tortilla” section where women stood behind a large counter, wearing white aprons and white hats to keep their hair in place and out of the food. They mixed the corn dough, patted it out, shaped it into circles in the palm of their hands and then placed one by one next to each other on an enormous hot, flat metal grill. The delicious smell of those circles as they browned on the edges and puffed up, made my stomach growl. Magically, they knew exactly when to turn them over for a few instants, and they were ready. FRESH TORTILLAS! “Un kilo por favor” I would say. They weighed out the tortilla stack adding or subtracting one or two and then wrapped them up in a sort of brown butcher paper. In the car on our way home my dad and I would carefully unseal that butcher paper, we would each take out a still warm tortilla, roll it up in the skinniest roll possible and happily devour it. When we got home, daddy would put on Sinatra or Mexican Trio Music and we’d put away the groceries to the rhythm of their tunes. After we’d get everything put away, at around eleven as she did every Sunday, my Jewish, Hungarian grandmother, (my mother’s mother, Lily), would arrive at our house to begin preparing the big Sunday afternoon meal. My Uncle Mundo – my mother’s little brother would pick my grandmother up at her downtown apartment and bring her over to our house. After playing for hours in our yard, I’d get tired and I would go into the kitchen. I wanted to see what my grandmother (Grema) was making. I would stand on a chair leaning on its back so that I could get a good view of my Grandmother cooking. I wanted to know how she made nokedli, the most delicious dumplings in the world. 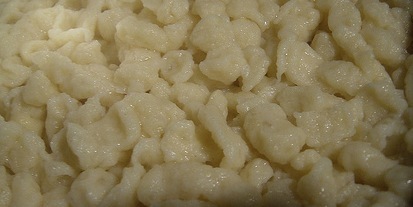 She mixed flour, water, and salt to just the exact consistency, poured it on a flat plate and holding it like a waiter holding an entrée above his shoulder, with the edge of a wooden spoon, would precisely tip the dish and shave edge after edge of dough into a pot of swiftly boiling salted water. Lunch in Mexico was at 2 p.m. After having worked all of her Hungarian know-how into a meal where we ended up with puffy tummies and the remnants of her sauces on the edges of our mouths Grema would be exhausted. “Lunch is ready” she’d call out in Hungarian. On that table in the middle of Mexico City, on a Sunday afternoon in 1962, there sat, nokedli, those Hungarian dumplings, toltotkaposta, my Grandma’s famous stuffed cabbage, or Hungarian chicken paprikash. Without fail, on the side, there were hot tortillas, guacamole, bright green serrano chile peppers, and a shallow bowl filled with fresh cilantro leaves. Excitedly we’d all sit down to eat to the din and clang of Hungarian, Spanish and English being spoken, with Sinatra playing in the background. This was life from the very beginning, a melding of old country recipes with the staples of our new home.